Buljarica was hot and humid under high sheets of cloud sliding slowly in from the Adriatic. The small meadows on the narrow coastal plain behind the huge reed bed have no gate just a piece of cord slung across the entrance and are now high with grasses, bright yellow brassicas and pale blue flax. The warm weather of the past few weeks has transformed the bare fields into knee-high seas of yellow and pale blue. The common meadow grass is, I think, sweet vernal grass (Anthoxanthum odoratum) and grows with white clover (Trifolium repens) and patches of lesser yellow trefoil (Trifolium dubium). Around one in ten of the fields has been cultivated but not yet planted; perhaps that waits for the next bout of rain. The land and most of the water courses are now dry and I am guessing that there is one hay harvest before the long, hot summer arrives. The roadsides are full of tall, rosy garlic (Allium roseum) and large, swaying heads of Bromus grasses. The same blue broomrape (Orobanche sp.) that I thought was on the Shepherd’s needle (Scandix pecten-veneris) in Virpazar is also common on the roadside and may not be on the umbellifers but the legumes. 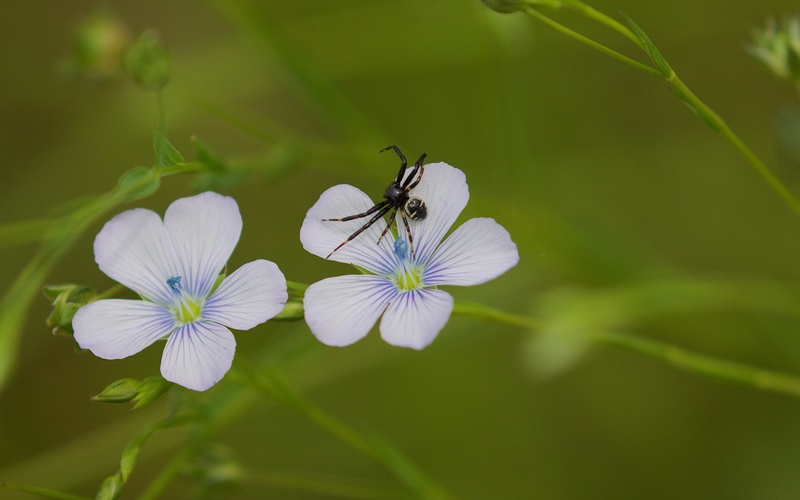 The roadsides and meadows have abundant narrow-leaved flax (Linum tenuifolium) that sway in the breeze; a wonderfully marked black, spider species was hanging on to one flower. 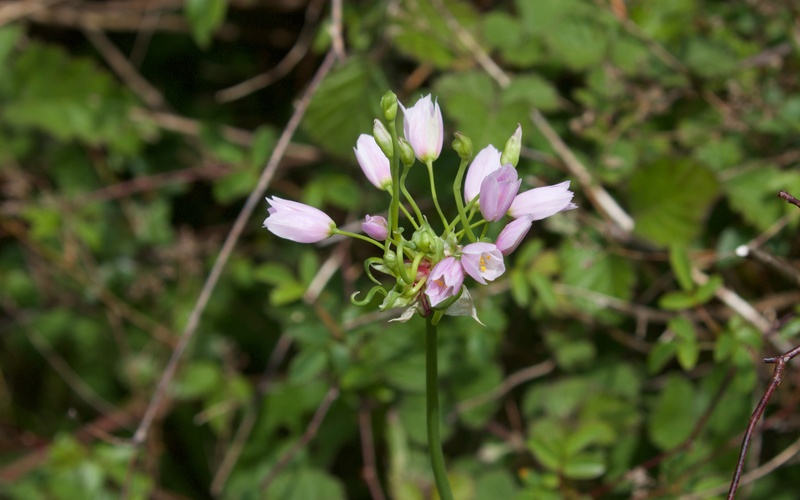 Rosy garlic and narrow-leaved flax. 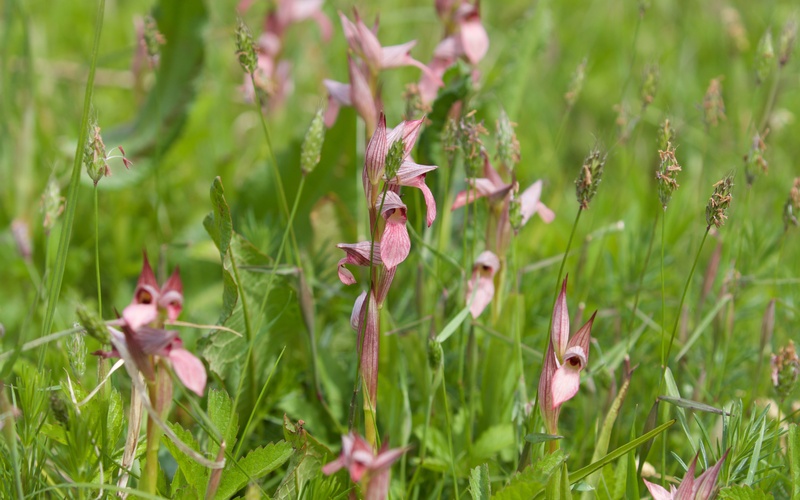 The dry meadows are full of tall and exotic tongue orchids (Serapia lingua) replacing the pink butterfly orchids (Orchis papilionacea) that are now dying back. Nearer the reed bed, the water meadows are damper with drainage ditches filled with bullrush (Typha latifolia) and yellow flag iris (Iris pseudacorus). 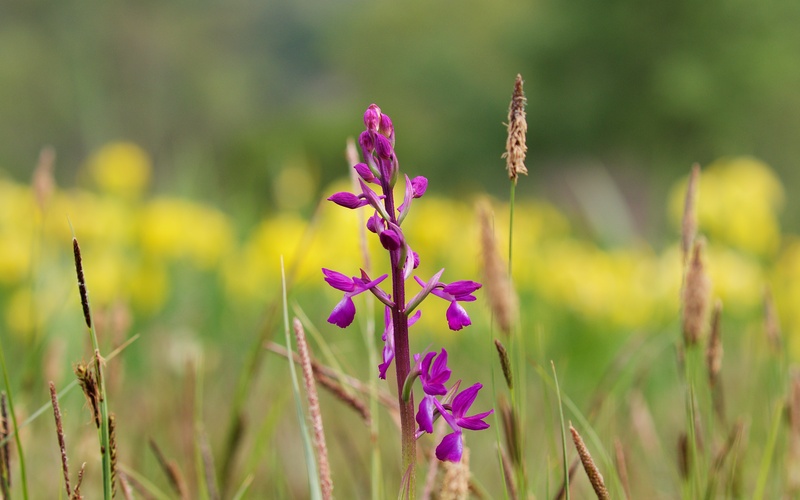 Loose-flowered orchid (Orchis laxiflora) is common in the fields and Aristolochia rotunda dominant over large patches of the small fields. 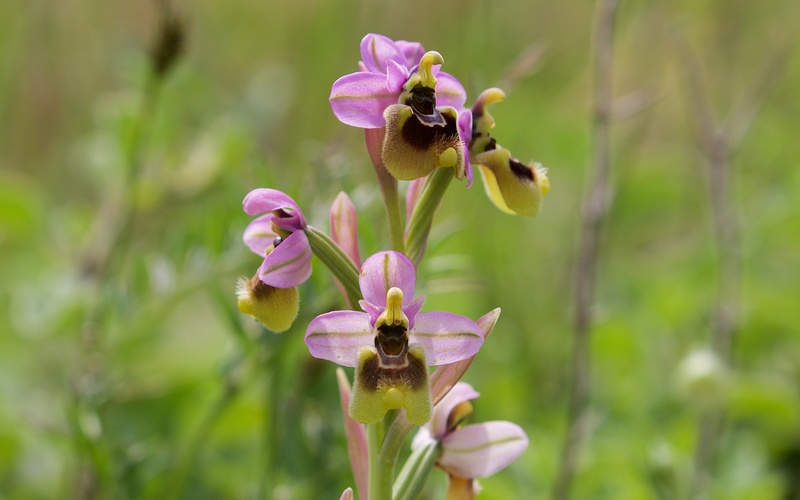 One sawfly orchid (Ophrys tenthredinifera) was in the drier, fallow fields with the tongue orchids. This is a wonderful plant that has a goofy character because each flower looks much like a cartoon hound. I looked for more in the fields but could not find any. 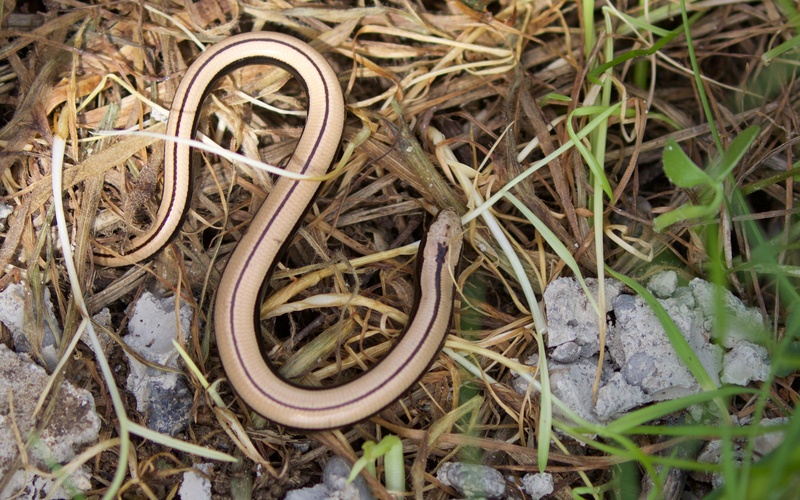 Under some some stones, a very fast moving large centipede and two slow moving millipedes as well as a young, white-sleek slow worm (Anguis fragilis). There are numerous reptiles everywhere I walk and most are the sound of leaves as they run from the path. The best are the large, Balkan green lizards (Lacerta trilineata) that often hide but not very well and then, perhaps realising their foolishness, run fast for better cover. 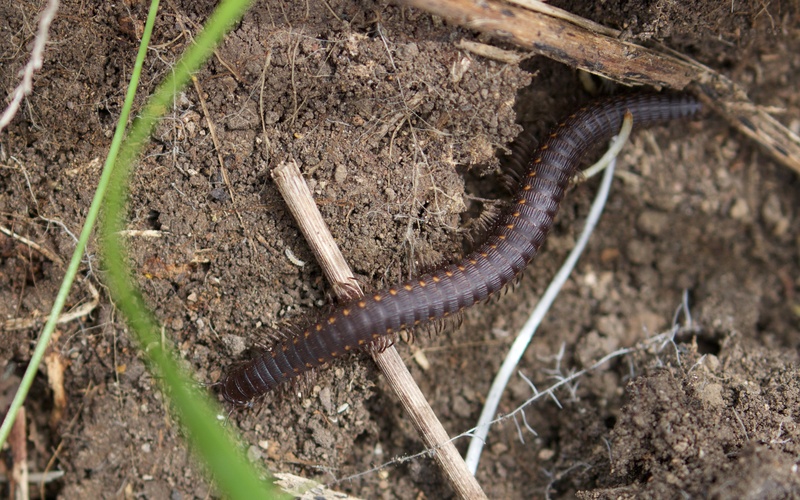 Large millipede species and young slow worm found under stones. The fields held a few blue butterflies including a pair of mating holly blues (Celastrina argiolus) in the adjacent hillside maquis, but very few dragon and damselflies (Odonata) are on the wing, which is surprising given the recent spell of hot weather. The reed bed only had a few swallows chasing over it, together with a squacco heron that took fright on my approach, circled out to sea, and came back round to land in the same patch of club-rush (Scirpus sp.). 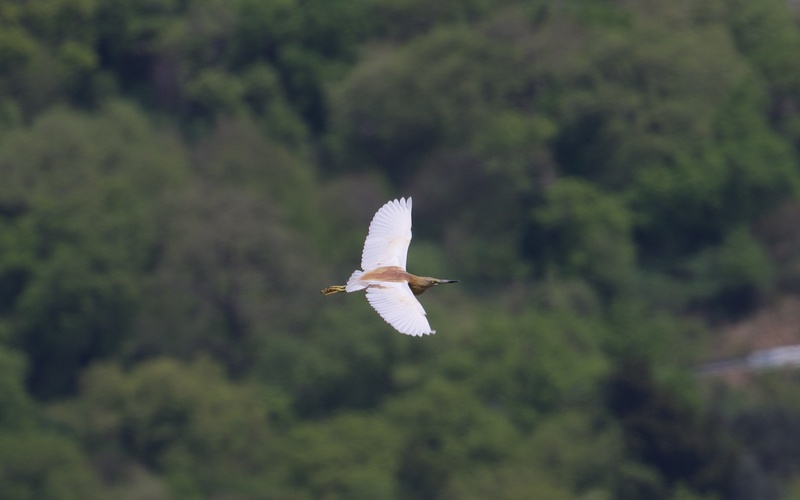 Squacco heron coming into land in the reed-bed.